The U.S. Centers for Disease Control and Prevention (CDC) reported this flu season to be the worst in a decade. As the virus spread across the entire country, sales of hand cleaners, particularly sanitizer and wipes, have also gone viral, according to global information company The NPD Group. 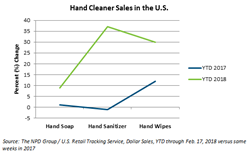 Hand cleaner sales at retail reached $83.6 million in the first month and a half of 2018*, a 16 percent increase over the same period in 2017. The fastest growth came from hand sanitizer, which generated $17.8 and grew sales by 37 percent versus last year. Hand wipes grew 30 percent to $11.2 million, and hand soap, the largest segment representing $54.6 million in sales, increased by 9 percent. Product sales within the commercial channel followed the same growth trajectory.